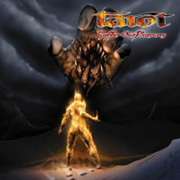 Veteran metallers Tarot have been delivering fine albums since 1986, albeit with several extended breaks over the years. Founded by vocalist and bass player Marco Hietala and his brother, guitarist Zachary Hietala, in 1986, the band's style of melodic metal has evolved over the years from a classic Iron Maiden-influenced sound to the dark, aggressive power metal displayed on Suffer Our Pleasures. Although Marco has spent time with fellow Finnish power metallers Nightwish and Sinergy, Tarot incorporates very few of the frilly, happy neo-classical elements so often found in European power metal. The overall mood of Suffer Our Pleasures is one of sinister aggression, created mostly by the raw growling voice of Marco and the ultra-heavy riffs of brother Zachary. Marco's most aggressive vocals come on the album opener "I Rule". He conveys the lyrics with throat-shredding intensity while Zachary churns out the riffs. Marco's cough following his final blistering shriek is a humorous touch. The progressive elements of Tarot make an appearance in the way of a meandering organ solo that is, thankfully, brief. For the most part, the keyboards of Janne Tolsa are used primarily to set an atmosphere and tend to blend well with the compositions. The first track marks a slight departure to this, as does the flamboyant organ solo on "From The Shadows". "Rider Of The Last Day" shows Tarot at their darkly progressive best. A slow-burner of a song with varied synths, frequent time changes, and an occasional psychedelic moment, Marco holds it all together with his most powerful vocal performance on the album. Heartfelt and compelling, he delivers the lyrics in convincing fashion. Despite being the shortest track on the disc at just barely over 4 minutes, my personal favorite track on Suffer Our Pleasures is "Unborn Son". Beginning with a heavy bass strum from Marco along with ethereal and slightly eerie keyboards, I feel the chorus is the most memorable of the album. Marco's bass lines are quite prominent and Zachary contributes a quality solo. For the most part, the songs on Suffer Our Pleasures don't tend to stand out on their own. This is not to say that the album is full of fluff, however. Each track is a testament to the exceptional quality of musicianship possessed by the members of Tarot and there certainly are enough innovative elements to keep things interesting - but just short of remarkable. I would recommend this album to fans of bands such as Angel Dust and Iced Earth.